From the Fall 1955 collection, this is a sketch of Dior's back-buttoned camisole dress of tawny wool, with a panel flying free from the skirt, and a cropped jacket with back fullness. Here is Dior's dress, as envisioned by American dress manufacturers, adapted for the evening in metal-shot moire, and incorporat9ng the panel into the skirt. A very fitted jacket is substituted for the loose one. In one word? Dreamy. 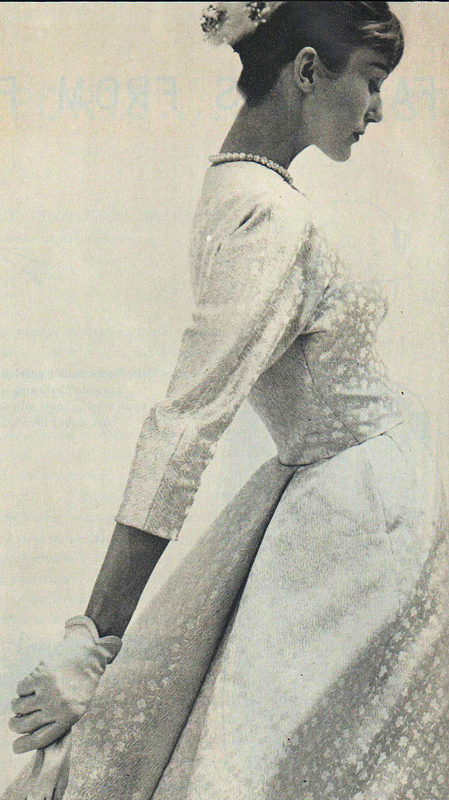 Featured in Woman's Home Companion, October 1955 edition. I really like the outfit in the sketch - gorgeous! The sketched Dior outfit looks so comfortable, yet elegant - it's a winner, for sure!